So, as the adage goes, stories of my demise are greatly exaggerated. Unfortunately, I cannot say the same for one of my 3TB work drives. It no workie anymore. Work drives are my day after day use – digital darkroom processing, searches general access and always connected to my main computer for ease. Luckily, all of my photos are backed up on a fully raided NAS drives. So nothing lost (relief). However, it took 6 nonstop days to copy back from the NAS drive onto a brand new working drive. Yes, there is a tremendous amount of finger crossing that nothing goes wrong with the originals while copying back. All done now, nothing lost but my time away from the blog. Let’s remedy that now! 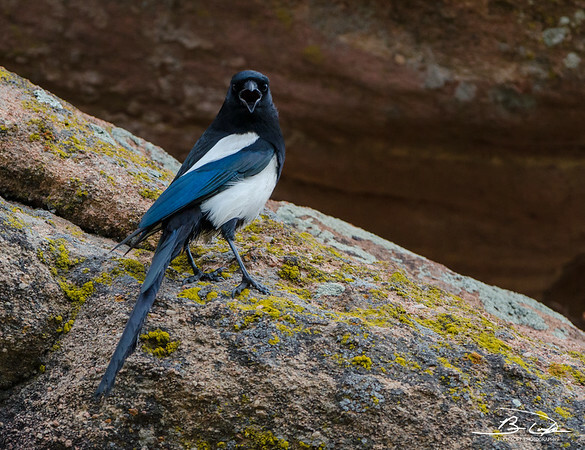 Today’s featured feathered friend comes to us courtesy of Red Rocks Amphitheatre on a trip to Colorado back in May 2014. 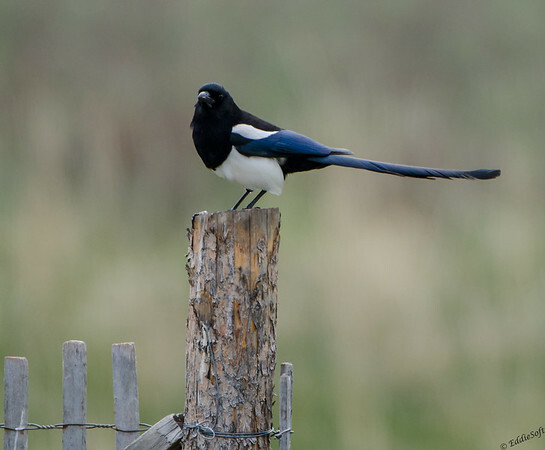 The Black-Billed Magpie is not a new bird to the blog having been previously featured back in July 2008 (link here). That also happens to be the first time I had ever encountered this colorful bird. We were passing through South Dakota on our way to visit Yellowstone. One of the great things about having a photography blog over the last 10 years is you get a firsthand look at how you are improving your craft. Those initial first shots are quite the fuzzy mess. I did get a little better when they appeared for a second time back in February 2015 (link here). There is always room for improvement, but these are a far cry from that initial effort. Those were taken from a good distance, where this third installment had much better foot zoom. Thing is, the closer you get to these members of the Crow family, the more you realize just how menacing they look. Something about those dark hoods that energizes the flight instincts whenever they show up in my viewfinder. Truthfully, my encounters with this large bodied birds has been quite cordial. They simply go about their business as if I am not even there. In this encounter on the outer loop of the Red Rocks trail, I heard a weird rustling sound under a bunch of sage. Not wanting to move off the trail, the next 20 minutes was spent trying locate the moving sound. Thinking I was on target, then engaged in some birding yoga in an attempt to find an angle giving a glimpse of the ruckus source. Hear sound, move to approximate location, peer through the brush only to hear it a few feet in another direction. After numerous search cycles it became a quest. I was either going to be eaten by an annoyed coyote or get something in the tin worth blogging about. During the course of this hunt people would walk/jog by with inquisitive looks. You get this a lot when you are standing around with big glass out in the wild. Embarrassingly my repeated response to their inquiry was “I don’t know” with a couple of “Yeti” just to spice it up a bit. After the fun of taunting me wore off the mystery animal flew up on a nearby post. Yep, a Magpie was just foraging for food in the thick underbrush. At least something went into the tin so it was worth the time … I suppose. 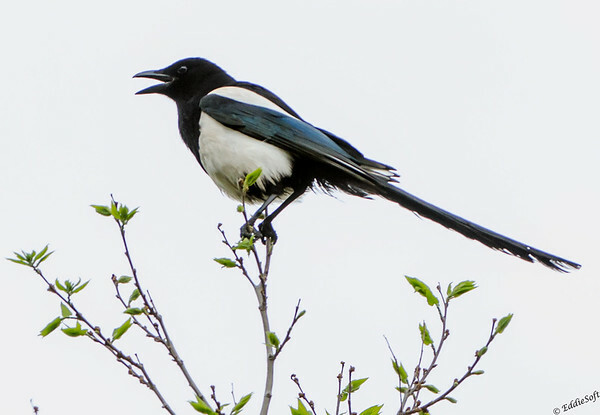 Interesting creatures these Magpies – apparently enjoy making fools of us humans. That’s all I have for you today folks. Just wanted to knock the cobwebs down a bit since it has been a couple of weeks since posting. Take it easy everyone and hopefully my technical difficulties are resolved.